National Environmental Education Week (EE Week), the United States’s largest environmental education event held each year the week before Earth Day, inspires environmental learning and stewardship among K-12 students. 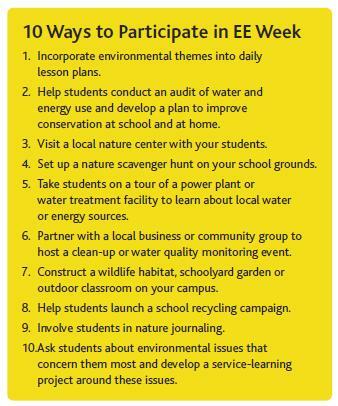 EE Week connects educators with environmental resources to promote K-12 students’ understanding of the environment. EE Week is a program of the National Environmental Education Foundation.